Hill's d/d diet is carefully formulated to help with the treatment of dietary allergies and food intolerances. These adverse reactions to foods which are perfectly good for most individuals are usually to one or more of the specific proteins in the diet. These ingredients are very unlikely to be associated with any sort of reaction, so the symptoms should gradually improve after several weeks of being fed Hill's d/d. It is important to prevent any other foods from being eaten as well, or they might prolong the underlying problem. Moderate amount of high digestibility Helps avoid common food allergens. Carbohydrate Solely from pea Adverse reaction to green pea is rare. Two novel protein formulas combine a single novel animal protein source (venison) with a single source of carbohydrate and vegetable protein (green pea). During Elimination Diet trial, ensure d/d™ Feline is the only source of food. Particular care is required with cats allowed outdoors. For increased palatability, the dry formula is coated with hydrolysed chicken. To avoid an allergic reaction this hydrolysate has an average molecular weight <6,000 daltons and no intact protein molecules. d/d™ Feline can benefit cats with chronic otitis externa (which can be a sign of an adverse food reaction) and cats with non-allergic skin disease, by providing essential nutrients. Fish oil, highly purified to exclude any protein residue, is added as a source of omega-3 fatty acids. Prescription Diet™ Feline z/d™ ULTRA Allergen-Free canned. Prescription Diet™ z/d™ Low Allergen Feline dry. 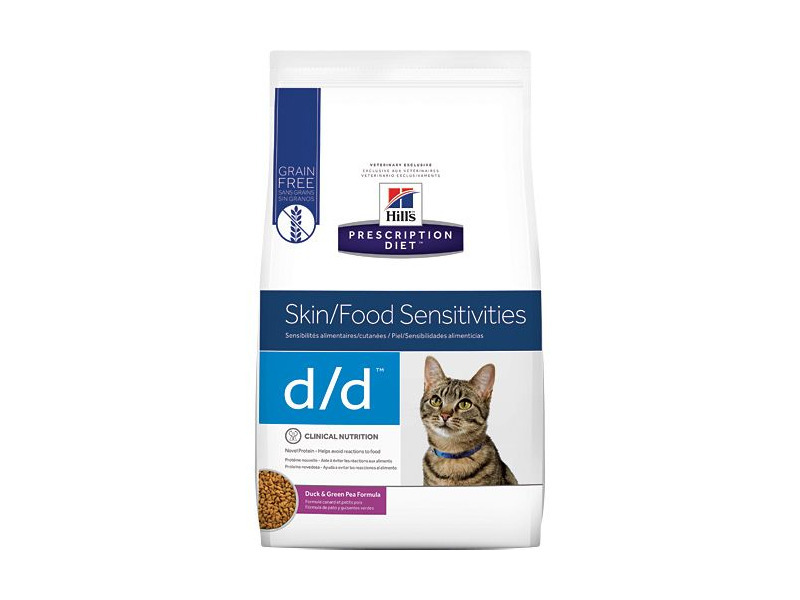 Below are some recent questions we've received regarding Hill's Prescription Diet d/d Food Sensitivities Cat Food, including answers from our team. I have been trying to get Hills DD wet canned food for ages but it never seems to be available any more. Can you tell me if there is a problem getting hold of this product please? I am sorry to hear that you've been struggling to source Hill’s™ Prescription Diet™ d/d™ Feline Venison tins. Unfortunately, this product has been discontinued due to a global shortage of a specific venison ingredient. The venison ingredient used to manufacture the canned product has a very strict specification. Our supplier informed us that there is an increased global demand for venison, and they are not able to supply the venison ingredient with the specifications needed to manufacture nutritionally appropriate Prescription Diet™ d/d™ venison canned products. We investigated the possibility of finding a comparable quality or form of this venison ingredient from other suppliers, but with no success. The dry version of this food is still available, but if your vet would like to discuss alternative recommendations with the vet at Hill's, then you can do this via your veterinary practice; just ask your vet or nurse to contact them on 0800 282 438 and Hill's will take it from there. I hope that's been helpful, if there is anything else I can help you with please let me know.